The Maxim III digital controller. INNOTECH Control Systems has announced the imminent release of the Maxim III digital controller, the newest addition to the Maxim family of products. This unit is capable of controlling various types of industrial and commercial systems, and is able to operate as a stand-alone device or as part of a network of controllers. The versatile Maxim III is user-friendly, programmable and functional. It features 20 configurable universal inputs, 12 relay outputs, and eight analogue outputs that enable control and monitoring of external equipment. Additional features include multiple 365-day time clocks with optimum start capabilities, optional Human Machine Interface (HMI) featuring a 4-line 20-character LCD display, and the capability to operate as part of a network of Innotech devices that support Global NetComms. Optional data logging enables the unit to store 200,000 time-based readings on board. Maxim III is also available with RS485 communications and an optional Ethernet Port for direct TCP/IP connection. Easy to install and program, Maxim III is suitable for applications such as control and monitoring of air conditioning, heating, lighting, cold/freezer rooms, and time clock control. 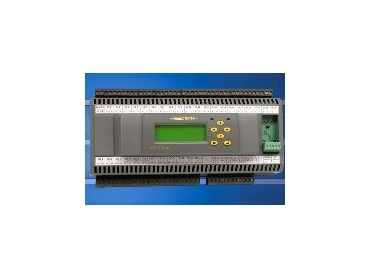 The Maxim III digital controller will be available in the first quarter of 2005.